I love logon scripts. It saddens me that Group Policies are replacing logon scripts as a method of providing access to ‘Shares’ and network printers. My point: while I am delighted to help you with PowerShell 3.0 logon scripts, really, you should at least look at Group Policy alternatives. Our test example will be a script that maps a network share to a local drive letter – say ‘P:’. Let us begin by making sure the VBScript method called MapNetworkDrive works smoothly. This may sound bizarre, but I often share out a folder on my local machine, and use that in my test script. My reasoning is this, when getting started I want to avoid problems associated with permissions, firewalls, or flaky wireless networks. My example script assumes you have a share called ‘Stuff’. The crucial piece of knowledge is that PowerShell has a cmdlet called New-Object. Furthermore, you should specify the type of object as: WScript.Network. Note 0: Naturally, to get this example working you need to change \\YourMachine to a computer on your network. Note 1: You may recognise $Net = as declaring a variable. Note 2: Our old VBScript friend MapNetworkDrive is method that is available to the ComObject called WScript.Network. Note 3: If you are not familiar with VBScript, then here is a refresher on VBScript Logon Scripts. Assuming the above script works, then we can progress to saving the commands into a .ps1 file. The easiest way is using the PowerShell 3.0 ISE; simply go to the file menu and ‘Save’, just as you would with an application like Notepad. By design, and by default, script paranoia will prevent our PowerShell .ps1 file from actually running. Let us take a time-out and investigate how to overcome this problem by changing the computer’s Execution policy. The result is likely: Restricted. Fortunately, we can use the sister verb called ‘Set’ to allow PowerShell scripts to run. Note 4: ‘Set’ instigates a serious change in your machine’s ability run scripts, so you should read the on-screen message before you click ‘Ok’. Note 5: If time permits please check the other options such as RemoteSigned, and for later experiments, Bypass. 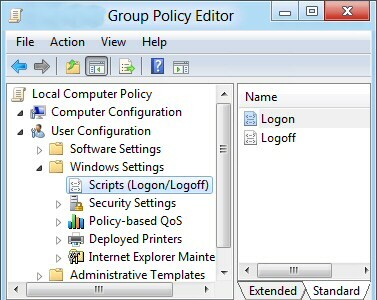 The last part of our mission is to ‘wire-up’ the PowerShell logon script to a Group Policy. On a stand-alone machine launch Gpedit.msc, or on a Domain Controller launch GPMC.msc. Scripts (Logon/Logoff) … see screenshot. Naturally, you select ‘Logon’ from the right pane. What happens next depends on whether you have Windows 7 or Windows Server 2003 R2 or later. 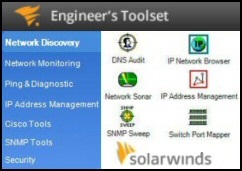 As ever, if you have an up-to-date operating system, then configuring is easy. Select the PowerShell Scripts tab, then click on ‘Add…’ and now make the connection between your PowerShell.ps1 file and the ‘Scripts’ policy. If you have an old system such as XP or Windows 2003, see plan B. Note 6: The trick is to copy your logon.ps1 file (into memory) then paste into the location revealed by the ‘Add…’ button. The actual location C:\Windows\System32\GroupPolicy\User\Scripts\Logon is a hidden folder. This is one reason the above interface provides a ‘Show Files…’ button. To see the files in Windows Explorer you may need to change the folder view options. Another frustration is if you try and paste files to this folder using the Windows Explorer you get permissions problems. For reasons I don’t fully understand, if you paste using the Policy Editor it just works, whereas Explorer just complains about permissions. Troubleshooting: I get much more success if I wrap the PowerShell file in an old-fashioned .bat file, see here. Latency – I found a 2-3 minute delay before Group Policy delivered my mapped network drive; most strange, but it was a pre-beta release. One problem in Windows 7 (and later) is that mapped network drives don’t show up in Windows Explorer. However, you can ‘see’ them in PowerShell! By that I mean GetChildItem "Drive Letter" lists the files, actually plain C:\ (or other drive letter) lists the files. Batch files for logon scripts are strictly a Plan B option; a fall-back for situations where the above method fails. If you created .bat files in the days when DOS was king, then this is straightforward process, if not, then just copy and paste! 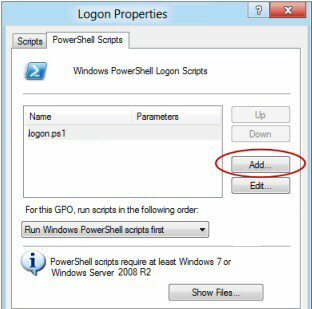 The situation is that something is preventing you from assigning the PowerShell logon script to a Group Policy. The solution is to create a .bat file that calls your PowerShell .ps1 file (holding the commands to map a drive). Observe the neat feature of the PowerShell file: -Bypass. The purpose of this parameter is to over-ride any restrictions that maybe present on the computer where you want to run a logon script. See more about external PowerShell commands. This article breaks down the task into self-contained components: creating the logon Scripts, testing the .ps1 files; and the tricky part: assigning your script. If all else fails with Group Policy, try a .Bat file as an alternative wrapper for your PowerShell 3.0 Logon Scripts.